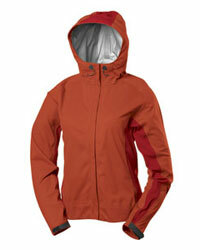 GOLite says:"A versatile stretch, waterproof breathable shell that is ideal for windy, wet conditions. GoLite laminate a micro porous polyurethane membrane between two layers of four-way stretch polyester and treat the outer surface with a super DWR to build waterproof / breathable garments with excellent freedom of movement plus more breathability than regular storm shells. Trinity® products are designed with comfort in mind: the stretch allows for a terrific range of motion regardless of the activity, the waterproof protection keeps you warm and dry whatever the weather." I've worn the GoLite Gamut Soft Shell Lightweight Jacket as the outer layer on a number of short(ish) nordic walking and low level walking trips during the Autumn months. The conditions have been mild, showery with a light wind. With the Gamut, GoLite do seem to have achieved a light-weight yet extremely comfortable jacket which kept me dry and comfortable for the duration of my trips. I really liked the short, slim fit design which in combination with the stretchiness of the material results in a garment which is great for any activity where you need a good range of arm movement. By definition, light weight means minimalist design so the Gamut has few 'adornments'. There's a good sized hood with a face-guard which closes up nice and cosily. There are only two zipped side pockets which I could access whilst wearing my belted day pack. These are hand-warmer size - so not big enough for an OS map. The front zip opened and shut easily and includes a toggle just about big enough for use with gloved hands. Whilst the Golite Gamut may not be the best option for prolonged heavy rain, if you want a genuinely light-weight, stylish jacket for Spring, Summer and Autumn showers - on the hills or around town - then this is worth a look.